Spring might get you started thinking about flowers and sunny patterns and bringing the great outdoors indoors. So if spring has sprung some decorating challenges on you, here are some delightful ideas for choosing upholstery and accompanying pieces. Some people avoid floral patterns because they feel cliched or seem to age a room, but if flowers are your thing, you can make them look really youthful and unique. Depending on your tastes, floral patterns can be lovely and subtle or brave and splashy. Think carefully about what style would match your decor personality, but remember, subdued rooms need a pop here and there. The same goes for vibrant rooms, which need understated areas for contrast to rest the eye. 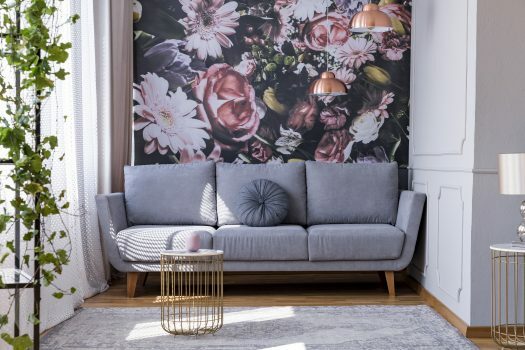 If you’re looking for surroundings soft as petals, florals can be elegantly striking if used sparingly in rooms with white or natural neutral walls. Choose an area rug or complementary upholstery with colors that reflect the floral hues, but with a simpler motif. It’s important to match any accent colors exactly to the flowers. Leather furniture can keep a floral room grounded and tasteful. Also, keep in mind that patterns with smaller flowers have a delicate, but refreshing effect on a room. On the other hand, large blossoms draw more attention for people who want a more vibrant look. The larger the flower patterns, the larger the personality of the room. If you like big blooms, but are a little bashful about letting them rule the room, use them on smaller items like chair upholstery or a single large flower motif on one item. If you’re really trying to make a statement, mix floral prints and animal patterns for a purposeful and playful clash of exciting ideas. Either way — soothing or splashy — you can look for furniture with flower patterns carved into the wood or wrought-iron designs that take you down the garden path. Flowers aren’t the only plant life that can live in your design. Look for leafy patterns, birds berries too. Pantone’s Color of the Year is the gorgeous tropical Living Coral, a sunset orange-fuschia that can liven the room if used liberally or bring a pop of color to a more sedate floral room. Meyers Furniture and Flooring is happy to help you find that perfect flower design this spring! Stop in to see us this weekend!